S3VEN. The number of mercenaries that were insane enough to take this challenge. The number of rooms they’ll have to survive through to claim an impressive reward. The number of ways they could get lacerated within the first five minutes. Out of character posts belong here, in character posts belong in the IC thread. To join S3VEN, you must do two things. A) Fill out the below character form and post it here. B) In one sentence, tell me how your character would take on a charging Velu panther. Please keep in mind that you will not be starting out with any equipment or weaponry, but rather you will receive them at the beginning of each chamber. You should quite literally strip your character naked of anything they own. Jumpsuits will be provided. Once you have signed up, you will be added to the list below, along with your character, and assigned a number of 1-7, for easy reference. Picture: N/A, as of now. Bio: Vandore is always up for challenges, and often gets himself in insane situations, but usually keeps some sort of scar, and he will not remove any of them. He has quite a bit of them, and in weird places. Strengths: His strengths are often keeping a cool head in dangerous situations, meaning he can help others if they are screaming their head off. Weaknesses: Any time he sees a member of his family, he loses complete control of everything in his body, because he caused their deaths. He mourns for them every night when he sleeps. Bio: Grendar is an average Tylarian. He is arrogent at times. Bio: Flank loves guns. A vaguely short temper won't win him the 'guy of the decade' award, but he generally is nice. He was a well respected Admiral of his races military, until he got into a little mishap, becoming ex-admiral. Strengths: The Ravis are resilient, so he can take quite a few hits. He is immune to tear gas and mace; he doesn't have eyes. He can rotate his cannon around to look behind him while running the other way. He knows Kung Fu (because I do awesome ) for close combat fighting. Weaknesses: Flank is a large target. Flank's metal implants conduct electricity, so electric based attacks have a huge effect on Flank. Also, he is very heavy, and cannot swim. Flank has a short temper, so he can't take aggravating situations for long. Since his little mishap on Ellismiron, Flank doesn't cope well around women, especially when they begin to flirt. This causes him to lose his nerve. Bio: Reeq is a veteran mercenary. His job have shown him the terrors of the world and he rather keeps to himself. Strengths: Being a mercenary veteran, Reeq have sharp reflexes and agility and being effient in hand-to-hand combat. He works well under stress and thus not panic. 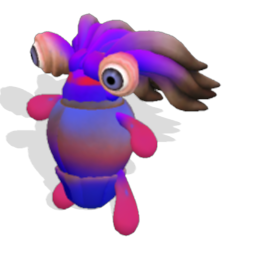 Weaknesses: Reeq got sever post-traumatic stress syndrom and can on occasion relive past battles, often getting paralyzed. Name: Micaneil Gorge "The Blue Bear turned Red"
Bio: An ex-sniper for the Blue Bear First Division who has seen many conflicts and gruesome demises; some of which are his own kills. Somewhat famous for murdering the general of his own sniper core simply because he issued an order that put him away from the front line of battle. Strengths: Remorseless in battle, isn't shattered by seeing death due to his past job. Extensive Spec Ops unarmed and melee weapon training. Very accurate with a gun. Cunning, and can trick people into doing things he wants to. Very resistant to pain. Weaknesses: Generally unlikable in social situations. Can't think properly when loud noises are present. Prefers using a gun to melee despite his melee training. Addicted to a drug that all snipers in Blue Bear took that prevents his hands from shaking. Claustrophobic. Bio: A tiny alien that aspires to be an adventurer, artist, inventer,scientist and zoologist. People tend to laugh at her because she's only the size of an average small potted house plant. Slurp always proves them wrong that it's not about size but pure determination. Slurp sometimes needs her special mech suit to reach for things, long journies or for some bit of protection. Strengths: Mech Suit, her size (it can be hard for everyone to not notice Slurp), Intelligence, strong grip, gadgets and small weponary perferably daggers. Weaknesses: Her size cause she can be squished easily, heavy things or objects, water (can't swim unless she has a floatie) and being litterly zapped. Bio: Fem’Nyla was once a supermodel and celebrity of the Nephid culture, even starting a “femme-fatale” craze on the Nephid homeworld of Aeeros. However, as often happens with most Nephid celebrities, she lost popularity after only a few years in the spotlight. Having become attached to this attention, she turned to embrace the darker side of her fame, training to be an assassin using the same “femme-fatale” tactics she was loved for. Her targets were often corrupt government or military leaders, so she believed herself to be doing more good than harm. One slip up in a job cost her a few months in prison, but she escaped after seducing the prison warden and stealing his keys. She lay low for a year, only resurfacing now to participate in the BuzKil challenge. Strengths: As with all Nephids, Fem’Nyla has four arms, meaning she can hold multiple weapons and concentrate on them all at once. She also is a skilled martial-artist and surprisingly strong for her size. She has an iron will, knack for escaping, and training with a variety of lethal weapons. I have just a few simple guidelines for posting in character. 1. Use third person. I don’t want any “I did this” mixed in with “he did this”. 2. I control the facility, so don’t post something like “he walked into the next room which had a giant pit in the middle of it!” I’ll tell you what the rooms are like when you get there. 3. Treat moving from one room to another like combat. If you try to go from one room to the other too fast, I’ll do something like make a barricade door close or a giant buzzblade come up from the floor. 4. Don’t try and keep yourself completely out of harm. I want at least three limbs missing (total) by the end of the challenge. Hurt yourself as much as possible, and receive a cookie when you’re done! Here I’ll post descriptions of each of the seven rooms you’ll be going through, as they appear. Note that there will be multiple areas of each room, and descriptions will be posted as you reach the rooms. If you fill out the form, and answer the question, yes. Just make sure you read everything before posting. I'd suggest reading the OP a bit more carefully. I don't know what a charging Velu panther is. You don't need to know. That's the interesting part. Just post how you would confront one and take it on. Adding you tala, though I'd like to see that sentence regarding the Velu panther... Sorta an initiation thing. If faced with a Velu panther, he would probably drop any ranged weapon he had, and fight it in close combat with a melee weapon. If he had no melee weapon, he would use his fists. In either instance, he would punch the panther in the face at least once. Whoops. I forgot that part. Well, what Vandore would do, was throw a cat at it to distract it, then whack it with a metal pipe. Adding Darkshadow to the list. Bump, I wanna see more people here! When is this going to begin? @Tala, it will start when I've got seven people ready to start. @Lazer, yeah, I've got a knack for bad timing. But I'll keep waiting. EDIT: retyped character sheet, check next page of thread. Potato, that looks good, but I use a slightly different character format than the Ranger's do. I would suggest taking a look at the OP, and modifying it slightly. Otherwise, you're pretty much set up. It's the equipment isn't it? I edited the post. His cannon he will have to keep but it will be empty I assume. I would prefer you modified your character to the exact, unless you are still editing it. Also, I'm not going to be putting up the picture if you still have equipment on your character. Sorry, but that's just how it works. To the exact? What does that mean? I'll get a picture without his equipment as soon as I can. I meant "to the exact format", meaning I want you to go to the OP, copy the format, and fill it out. Just so we can all sleep a little more peaceful tonight. When confronted by the charging Velu panther, he would jump over it, using his wings to gain as much of a jump as possible, and attempt to attack it from behind with his claws, or club it with his gun. Much better. Adding you now.